I guess that most of the people reading this post will probably have agonised about their artist statement. I know I've rewritten mine more times than I care to count! Inevitably I tinkered with it again while writing the posts for yesterday and today as I checked it out against my own checklists! The thing is that over time it genuinely has got better because it's now simpler in terms of concepts, language and structure - and it explains me and my work much better as a result. Which is not to say it can't be improved still further! Is there one right way of writing an artist's statement? Probably not - although a number of people are in agreement about what it should and shouldn't try to do. In doing my research for this post and my new information site How to write an Artist's Statement [UPDATED - with link to new website] I looked around on the Internet for what other people had to say about writing an Artist's Statement and the better ones are listed on the information site. Here are some articles which were the best I could find about how to write an artist's statement. Note they all talk about the artist's statement from a slightly different perspective. Artbusiness.com - How to Write an Artist Statement - Explaining Your Art - Alan Bamberger is a professional art consultant with nearly thirty years experience. He writes business articles and provides consultancy support for marketing, promotion, public relations, website construction, Internet selling, selling at online auctions, and career development. He has a robust approach which is matched by the way he writes. His is a very well informed and business-like approach. Molly Gordon - How to Write an Artist Statement - for those who like the cooking analogy (that'll be Adebanji!) Molly takes a cook's approach to creating the recipe for cooking that artist's statement to perfection! We each respond to advice in different ways and my guess is one of these will provide the trigger you need to get started on writing your artist's statement - or maybe revising and updating it. If not - you may find the following helpful. It's my summary of key points about how to write an artist's statement. They have been derived from what I've read and what I've learned in many years of producing and editing written material. I've also had experience of helping quite a few artists to arrange their thoughts as an artist's statement in a way which works much better than what they had before - according the very positive feedback received! What is an Artist's Statement? It was actually quite fascinating to see how many people talked about an artist's statement without saying what it is. Here's a few views about what an artist's statement actually is. An artist's statement is a short document written by the artist which provides a window into the artist's world. It offers insight into a single piece or an entire body of work and by describing the artist's creative process, philosophy, vision, and passion. It enlightens and engages while at the same time giving the audience - potential buyers, exhibition curators, critics, fellow artists, or casual browsers - the freedom to draw their own conclusions. An artist's statement reads easily, is informative, and adds to the understanding of the artist. Your artist statement is about facts, a basic introduction to your art; it's not instructions on what to experience, what to think, how to feel, how to act, or where to stand, and if it is, you'd better do a rewrite. An artist's statement provides an insight into the artist's work and how it came about. In short, an artist's statement is a brief summary of what an artist would say if they could explain their own work in person. It focuses on the present while providing as much information from the past as is relevant. The best artist's statement is authentic and is written in the artist's own voice, although not always by the artist, and in language which is always simple and accessible. What are the most important aspects of an artist's statement? This is a summary of all the things I've read that I agree with - plus a few recommendations of my own. Always be authentic - Be yourself. Say what you mean and not what you expect people to want to hear. Be inclusive not exclusive - your statement should help people to understand you and your work, rather than exclude people from your world. Keep it concise - edit, edit, edit! Use a spell check! A spell and grammar check is even better. Write in the first person - I guess I'm not the only person who feels uncomfortable doing this - but practice really helps to break down the barriers on this one. Thinking about it as a conversation also helps - it's the written equivalent of speaking to somebody about your work at a Private View. Write it for the people who you want to buy your art - this is not an academic essay! Aim to communicate rather than obfuscate (a word I've used quite deliberately to make the point!!!) Ignore all that conceptual artspeak and jargon that you see around - I've come across very few people who are impressed by it which rather suggests buyers might think likewise. Also remember that it's now very much associated with a contemporary art scene which has just fallen off a cliff in terms of sales and art which is now being devalued. Plus remember that the most articulate people are those who can explain complex ideas in simple terms. Who produces your art - if it's just you, learn to say "I paint" (or whatever it is you do to produce art). If you get people to help I personally think you need to indicate the precise nature of their input. Identify what you produce - this is the output of your efforts. What should it be called? 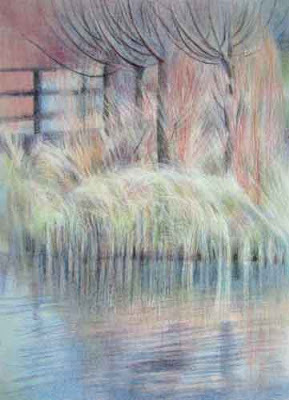 (eg landscape paintings in oil; flower paintings in watercolour). When you're doing this you might want to check out the popularity of different keywords relevant to art. I always have a keyword tool (eg Google Adwords keyword tool) open every time I change the text on my website. I write the content first and then check to see if I've used the most appropriate works to say what I want to say. Remember content first, check second. Say what your art is made of (eg dry media) - don't leave them guessing! Explain your reasons for your current choice of subject matter - Say why you work in this way. You might be exploring a concept. You might be exploring a place. Or you could be painting in series (which makes life sooooo much simpler!) For example, you might be developing a series of drawings with a view to achieving a gold medal in botanical art. Don't be afraid to review and revise over time - Don't worry if you keep changing your artist's statement - your art also changes over time so it's logical that your artist's statement should to. It can also be a very positive sign. It's very good if revision reflects how you are becoming clearer about what it is you do and what influences the way you work and what you produce. Find good examples of an artist's statement and then work out why you like them - why they speak to you. Maybe review them against my check list? Then you can use the lessons you learn from your research to help you draft or revise your own artist's statement. Say it out loud. Imagine yourself at a private view. The gallery owner comes over to you and introduces a new client who wants to start a collection. Now who you are, what you do and explain your art and record what you say. For some people this might be an embarrassing revelation about just how many words and clauses you can get into one sentence before you insert the full stop. When editing I frequently find people have often written never-ending sentences! However this is really not an issue to be too worried about on your initial draft. If still keeps happening then you need to get better at reviewing your own work or have somebody who is a reliable editor to help you. the number of times you say "errrmmm" out loud will quite likely correlate to the amount of "filler" words you use when writing. Again, that probably means you will need to do a ruthless edit yourself or find a good editor. Filler words are ones which can be left out without changing the meaning of what you are saying. I find when editing that I delete very large numbers of filler words on my first "pass". In my experience of giving very many presentations to hundreds of people at a time, if you have difficulty saying it simply, then the chances are you'll also lack the skills to write it simply. Keep saying what you mean until it sounds really easy on the ear and like the sort of conversation that you might have with a client. Consider getting somebody else to help you write it or write it for you. At they very least get other people to review what you've written. Some people lack confidence, other people lack writing skills and some have brains which do odd things with words sometimes. I've found that quite a few artists have difficulty with writing but are loathe to ask for help. Did you know that a great many artists are left-handed? Or that being left-handed is associated with dyslexia? It explains why some can artists sometimes struggle with words. Examples of difficulties I've come across include - writing sentences back to front; using words in a peculiar order, finding it difficult to simplify a sentence structure. However none of this is a problem if what you have to say is edited by somebody else. If you're not confident in your writing skills then try and get somebody who has skills to help you write it. However always makes sure it comes out sounding like you and not like them! I'd like to include more examples of good artist's statement on How to write an Artist's Statement (UPDATED - now on my Art Business Information for Artists website). I'd also like to encourage people to review practical examples and develop their skills in evaluating what works and what lacks impact. You can nominate an artist's statement any time between now and the 1st March 2009. You're not limited to one nomination. The person who, in my opinion, has identified the best example of a good artist's statement will receive free consultancy from me to help them improve their own artist's statement. So whether you're just starting out or looking to improve I'll review whatever you've produced so far, provide editing input and help you work on the statement to improve its authenticity and impact. The bonus is that in looking at how other people write statements you'll also be developing your own skills at evaluating how good they are and whether they 'speak' to you - plus everybody reading this post gets to share in a variety of examples of good artist's statements. Do let me know if you're up for this and have started looking! I had to write an artist's statement for the degree show at the end of my BA - One of the hardest things we had to do on the course. Definitely time I updated mine. Thanks a million for this post! It would have to be a whole days course for me. Katherine, this is something I have been putting off for so long, so thank you on my part for your generousity with your know how. All of your work is incredibly lose and fresh but the one above has such a gorgoeus delicate touch to it, that it is magical. This is good timing, as I need to rewrite my own artist statement. It definitely is a difficult task with a lot of drafts, edits and rewrites involved! Thanks for the links, they'll be good refreshers. You keep me thinking Katherine! Once I figured out the right questions to ask myself, the rest flowed. I am happy with what I have written for my bio and now I have added an artist's statement - something I was thinking I could avoid. After following your posts of late, I realized that may not be the best policy. I had previously added mini statements for each of my series and I had left it at that. However, the what needed more why - and the why could only come from inside, not only from the observations for the series themselves. I blogged on the questions today and the AS evolved. Thank you for your ongoing and inspiring advice, Katherine. "Ignore all that conceptual artspeak and jargon ... now very much associated with a contemporary art scene which has just fallen off a cliff." Is Maggie Stiefvater the next JK Rowling? Is printmaking becoming the new 'painting a day'? 22nd February 2009 - Who's made a mark this week? 15th February 2009 - Who's made a mark this week? 8th February 2009 - Who's made a mark this week? 1st February 2009 - Who's made a mark this week?